Do you love organization? I do. 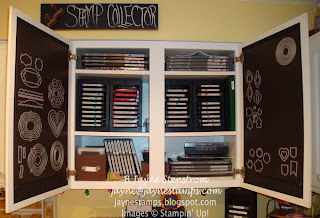 I love to find new ways to organize and store my stamps and accessories. 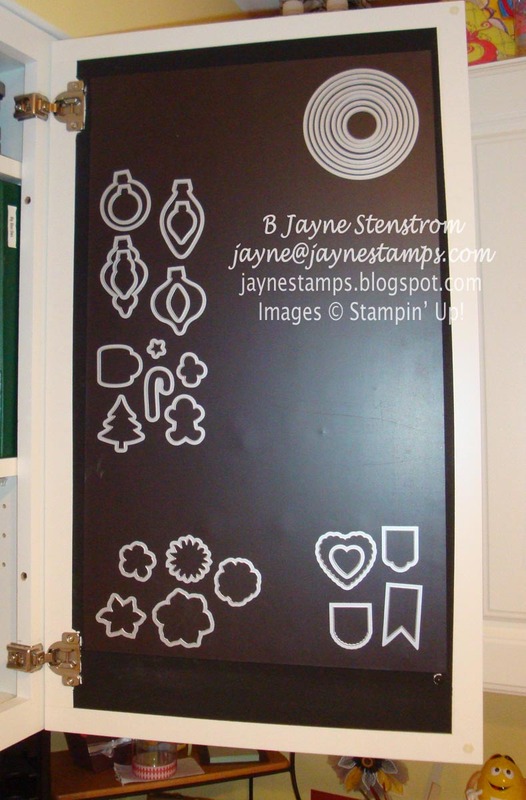 The Framelits and Edgelits from Stampin' Up! come in hard plastic envelopes, which are fine for keeping them and storing them, but I wanted something that was easier and faster to access when I was working. So I put large magnet sheets on the inside of a couple of cupboard doors to store the Framelits and Edgelits. I love it! They are always ready and easily accessible when I'm working in my stamp room. And the other side. As you can see, I have a LOT of room for more Framelits and Edgelits as they come out! This was sort of a long process to accomplish this. 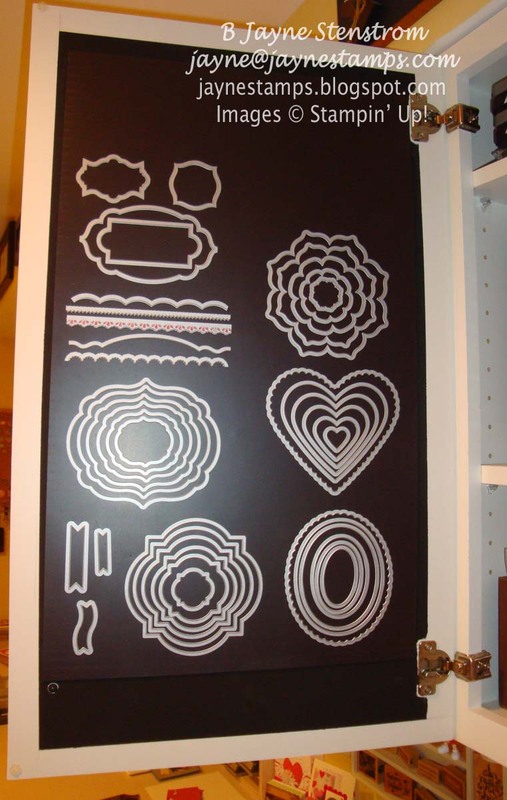 I looked around at local stores and hardware stores for large sections of magnet, but without any success. When I was in one well-known hardware store, I was explaining to the gentleman helping me what I wanted to do. He suggested "magnetic paint" (it's actually called "Magnetic Primer" on the can). I'd never heard of such a thing! So I bought a can of the paint (it's really HEAVY), came home, and started to paint. It said that it needed at least two coats, and probably 3-4 to be good. As I was in the process of applying the second coat, a thought occurred to me. Was the PAINT magnetic? Or would it ATTRACT magnets? Guess which one it did? So rather than melt in a puddle of despair, I got online and started to search for large magnet sheets and I came across Magically Magnetic Inc. They had lots of sizes and types of self-adhesive magnet sheets. I spoke with a gentleman there who was VERY helpful. 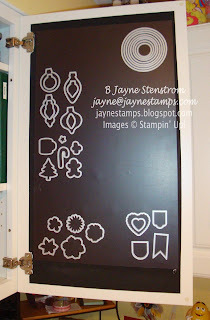 Because I had put the magnetic paint on the doors, I couldn't just use self-adhesive magnet sheets - they wouldn't stick to the paint. So we came up with the solution to stick TWO self-adhesive magnet sheets together and then I could use that on the paint on the doors. When my magnet sheets arrived, they worked perfectly! I'm so pleased with the storage, and if I need to travel someplace and take my Framelits and/or Edgelits with me, I can remove them from the magnets, put them back in the original envelopes, and take them with me. Easy-peasy! So it may have taken me awhile to get there, but I'm quite pleased with the end results. Do you have any unique ideas for how you store things in your craft room? I'd love to hear about them! Jayne, I love your idea of the magnet sheets on the inside of your cabinets. I'm currently using a 2 ring binder that has hugh pockets for the framelits and edglits. What I do is put a piece of SU retired megnetic sheets (but I don't remove the adhesive protective sheet) and sandwich it in between the product info sheet that comes with the framelits. This keeps them on the sheet and then I put that into the envelope in the binder (it's open on the top). I like it but I think your idea is better. Oh my gosh, you ROCK girl, what a great idea. Now all I need is a nice cupboard like that. Thanks for sharing your talent, ideas and great cards with us. I appreciate it. Blessings to you and yours.